This picture was a complete surprise, although the layout of the stable block is clearly shown on the 1885 plan, no photographs have been discovered of it, so here we have a shot outside the entrance to the stables, the archway leads through to an enclosed area with access to coach houses , stabling  and ancilliary rooms such as Shoeing sheds, Loose Boxes and Saddle Rooms. 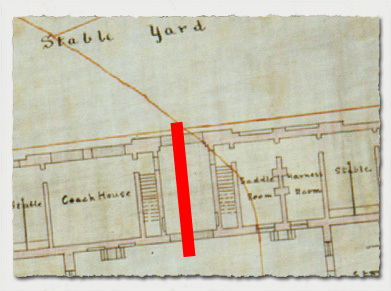 The plan below shows the layout of the stables, with the red line indicating the archway through to the stable yard beyond. Also for a full layout of the Hall click: View Plan. 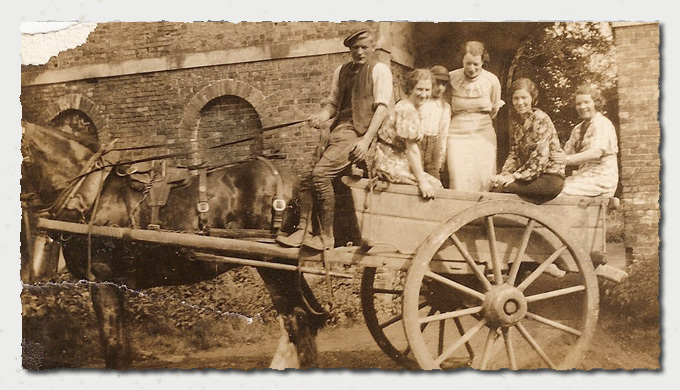 Again the picture features four ladies and the young boy who was seen holding onto the main of a shire horse in the picture taken in the stallion pens. The young man holding the reigns and in control of the cart is unknown, just like the boy. The string course of stonework above the blank arches does not show a corresponding course above the main arch, due to the limitations of the photgraph, but it is probable that a similar course ran above the head of the arch, if so one of the stones which would have been directly above the centre of the arch has been found. 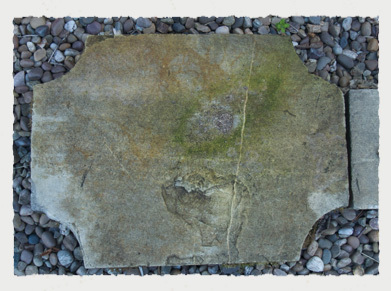 It was normal to create a centre piece which often had the construction date, on the face of a stone above the arch, this would have had a matching stone in the string course at the same level on the opposite side of the building, but for economic reasons this may have been blank, the photograph below shows such a stone, unmarked.